"a standout addition to the Masada catalog"
In this unique project for voice and saz bass, longtime collaborators Sofia Rei and JC Maillard offer a superbly intimate and introspective study of acclaimed source material of John Zorn. 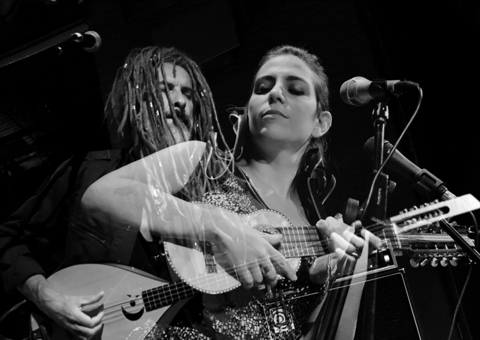 With lyrics by Rei and arrangements by both musicians, the songs explore a variety of topics, from love and solitude, to the ghost of Frida Kahlo and a childhood under dictatorship in Argentina. A captivating duet of unprecedented synergy, Keter has been coined "a standout addition to the Masada catalog". Sofia Rei and JC Maillard's duo album Keter is part of John Zorns Masada collection, which reached its final chapter in 2018. For a quarter of a century, this project has been a consistently exciting and influential presence in the landscape of adventurous music, involving renowned artists such as Dave Douglas, Bill Frisell, Marc Ribot, Pat Metheny, John Medeski, Martin & Wood and many more. With the third and final songbook, The Book Beriah, he concluded the Masada series with 92 compositions over 11 albums, presented by some of the world's most accomplished musicians.